Opioid receptors belong to the large superfamily of seven transmembrane-spanning (7TM) G protein-coupled receptors (GPCRs). As a class, GPCRs are of fundamental physiological importance mediating the actions of the majority of known neurotransmitters and hormones. The Mu, Delta, and Kappa (MOP, DOP, KOP) opioid receptors are particularly intriguing members of this receptor family as they are the targets involved in many neurobiological diseases such as addiction, pain, stress, anxiety, and depression. Recently we discovered that the aaptamine class of marine sponge derived natural products exhibit selective agonist activity in vitro for the DOP versus MOP receptor. Our findings may explain reports by others that aaptamine demonstrates in vivo anti-depressant effects in mouse models using the Porsolt Forced Swim Test. 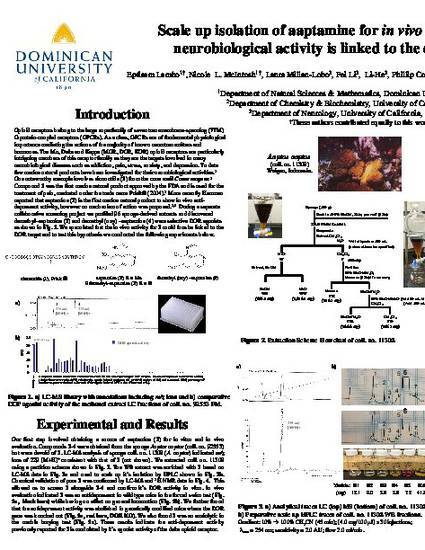 This project involved the extraction of the sponge Aaptos aaptos (a source of 1), establishing a scale up purification procedure to provide sufficient amounts of 1 (30 mg) for a follow up in vivo evaluation and ultimately confirmation of the structure of 1 using LC-MS and 1H NMR. The results our purification scheme, chemical analysis and in vivo evaluation of 1 using the Marble burying test in rodents are reported here in and suggest that the in vivo anti-depressant effects of 1 are linked directly to its agonist effects on the DOP receptor.